Total sales revenue for the Canadian solar thermal market in 2014 was $17.6 million, a 4% increase over the $16.9 million reported in 2013. Annual collector sales increased in 2014 to 99,666 m2 , up by 19% from 84,070 m2 installed in 2013. Following a record year in 2010, when domestic sales alone were $34 million (199,491 m2) and total revenues reached $37.4 million, the Canadian market has experienced a series of declines until this year. This improvement in 2014 is due to an increase in export sales from 26,003 m2 ($3.2 million) to 41,599 m2 ($4.0 million), primarily to the United States, which more than offset the reduction in domestic sales from 58,067 m2 ($13.6 million) to 57,688 m2 ($13.5 million). The reduction in the domestic solar thermal market since 2010 is due to the ending of financial incentive programs at the national level and the low cost of natural gas for heating. In recent years, solar air heating collectors dominated the Canadian domestic and export markets after solar pool heating. In 2013 and 2014, solar air heating collectors exceeded unglazed solar pool heating collector sales for the first time with 50% and 54% of solar collector sales and 52% and 61% of the revenue, respectively. 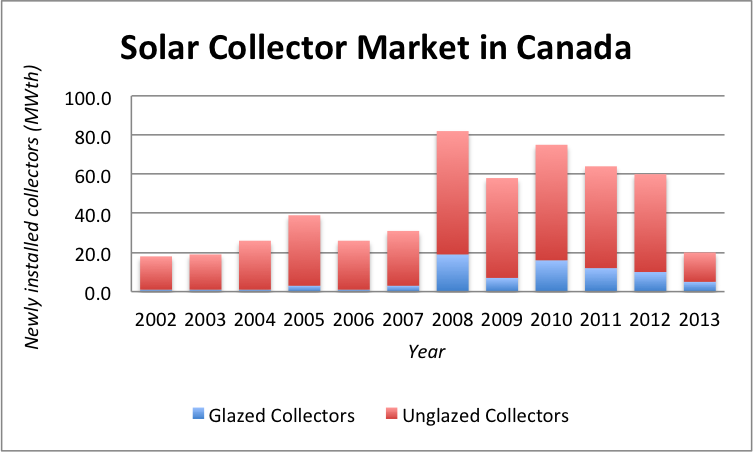 For several years there has been a significant increase in glazed solar air collector installations compared to unglazed, however, unglazed still represents 60% of total air heating collector revenue and 63% of air collector area sold in 2014. Unglazed solar pool heating collectors are the next largest segment of the collector market with 41% of domestic sales and 22% of export collector sales in terms of area, although the solar pool heating market represents only 18% of the solar thermal sales revenue. The typical applications for solar thermal products in Canada are space and ventilation air heating for commercial and industrial buildings (primarily using integrated unglazed and glazed collectors in open loop systems to heat outdoor air), residential outdoor pool heating (primarily with unglazed plastic flat plate liquid solar collectors) and domestic hot water heating for residential and commercial application (both glazed flat plate and vacuum tube liquid solar collectors. In 2014 in the residential sector, which accounted for 30% of total sales revenue, 40% of that revenue was for DHW, 31% for pool heating, 5% for space heating and the remaining 24% for combined/other systems. In the ICI sector (70% of total sales revenue), 83% of revenue was in space heating, 9% in service water heating, 6% in process heating and 2% in swimming pool heating. The typical packaged sdhw system is a low flow pumped glycol system with a side-arm thermosyphon heat exchanger connected to a solar preheat tank. Currently there are no regulations requiring the use of solar thermal in new or existing buildings in Canada. The key driver for purchasing solar thermal has largely been financial therefore changes in conventional fuel prices and financial incentive programs have a signficant impact on purchase decisions. Current low prices for natural gas heating and the expiration of national financial incentives for solar thermal have resulted in a decrease in the domestic solar thermal market in Canada. Heavily subsized FIT (feed in tarrff) incentives for photovoltaics in Ontario have also had a negative influence on the solar thermal market. In general, there is a low level of awareness of the potential for solar heating and cooling. New building energy performance standards under development may be a key future driver for the sale of solar thermal products in Canada as builders look for ways to meet the higher energy performance targets. There is a small domestic manufacturing base for solar thermal in Canada. The industry includes collector and system manufacturers, importers, as well as wholesale, retail, and installers. Solar thermal exports represented 23% of total sales in 2014. Compared to 2010, exports have grown by 18% and their relative importance has generally increased as total sales have tended to decline. The majority of export sales (79%) were solar air heating collectors, both glazed and unglazed with liquid glazed flat plate collectors at 10% of exports and unglazed liquid pool heating collectors at 11%. Total employment in the solar thermal industry in Canada among respondents of a survey for 2014 was reported to be 110 employees, down from 153 in 2012. This survey was not designed to capture all employment at the manufacturing, distribution, retail and installer levels, and therefore total employment is likely to be much higher than this. In 2014, the installed cost of large-scale solar district heating systems is estimated to be about Canadian $1,000/m2 for high-solar fraction (>90%) Drake Landing-like designs including the installed cost of: roof-mounted solar collectors, district heating network, borehole field seasonal storage, short-term thermal storage tanks, engineering, supervision and commissioning. A typical forced-circulation, 6m2 (two-collector), residential solar domestic hot water system with a preheat solar tank, circulation pump, side-arm heat exchanger costs CAD $7,750 installed, taxes excluded. Commercial-size solar water heating systems including solar collectors, forced-circulation pumps, solar storage tanks and heat exchanger typically cost between CAD $1000/m2 and $1500/m2 installed, taxes excluded for liquid heating flat plate or evacuuated tube collectors and approximately $250 (2013) for liquid heating unglazed (pool) collectors. The typical installed cost, of commercial-size air heating systems in 2013, including fans and distribution ducting range between CAD $150/m2 and $300/m2 using unglazed (open-to-ambient) air heating collectors and between $150/m2 and $1,500/m2 with glazed (open-to-ambient) air heating collectors, taxes excluded. In Canada, there is a focus on energy-efficient buildings rather than on solar buildings. In addition to solar water heating, several solar technologies including passive solar, solar air heating of the ventilation air and the living space, daylighting and photovoltaics are applied in such buildings along with non-solar technologies. Net-zero or near net-zero buildings represent the leading edge of research and development of highly energy efficient buildings. Certifications such as LEED for commercial buildings and Energuide for Houses in the residential sector are often sought for recognition of the efficiency levels achieved. Currently there are no regulations requiring the design and construction of very energy efficient or solar buildings in Canada. It is thought that a key driver for their construction is the desire to showcase the owners committment to reducing the environmental impact of their business. The current low price of natural gas is not believed to have resulted in a decrease in the very energy-efficient buildings market in Canada. Heavily subsized FIT (feed in tarrff) incentives for photovoltaics in Ontario have increased the use of PV on buildings. New building energy performance standards under development may be a key future driver for the highly energy-efficient buildings market by requiring builders to meet the higher energy performance targets. The incremental cost of building to achieve net-zero energy performance for a single-family Canadian house has been found to be between CAD $50,000 and $ 90,000, depending on the approach taken in the design and equipment selected. National R&D programmes exist for both solar thermal energy and for building energy efficiency through Natural Resources Canada (NRCan). In 2014, the budget for solar thermal energy was approximately CAD $1.1 million. The main priority is to accelerate the development by working with industry on technologies that have potential to be economically viable and contribute to significant greenhouse gas emission reduction. The current active solar R&D program is focused on increasing the utilization of solar energy through seasonal storage for both community scale and single family home applications and development of solar cooling systems for commercial/institutional applications. In addition to the above, a Smart Net-zero Energy Buildings Research Network, consisting of 32 top Canadian researchers in solar energy and buildings from 14 Canadian universities, have joined forces to develop solar-optimized homes of the future. The budget of the Network is about $6 million, with $4.8 million from the National Sciences and Engineering Research Council's Strategic Research Networks over 5 years. Previous major active solar R&D accomplishments in Canada include the transpired solar air collector and the low flow solar water heater product developments. These are now commercialized and the main technical support in these areas is related to testing and certification standards both nationally and internationally. Renewable energy currently provides 17% of Canada’s primary energy production, primarily from large hydro (11%) and biomass (6%). Canada’s goal is to accelerate the development of renewables by working with industry on technologies that have potential to be economically viable and contribute to significant greenhouse gas emission reduction. Canada plans to reduce its greenhouse gas (GHG) emissions by 30% below 2005 levels by 2030. The federal government has provided sustained research and development funding to this end through the Program on Energy Research and Development (PERD). Natural Resources Canada (NRCan) is the lead federal department responsible for solar heating and cooling R&D in Canada. R&D funds for solar heating and cooling are managed by the Renewable Heat & Power Group within NRCan’s CanmetENERGY-Ottawa. NRCan’s National Solar Test Facility (NSTF) located near Toronto, operated by Exova Canada, is Canada’s leading solar testing facility and supports NRCan’s R&D activities. It includes a 200 kW large area indoor solar simulator and climate controlled chamber where testing is performed for both product development and to Canadian and international standards for certification and rating. Other federal government organizations that conduct activities in support of solar energy and buildings research include Environment Canada’s Meteorological Service, which continues to manage solar resource measurement and meteorological data base development activities, the National Research Council’s Institute for Research in Construction in Ottawa, which conducts research in windows and daylighting technologies, and the Canada Mortgage and Housing Corporation led a demonstration of equilibrium or net-zero homes across Canada which was completed in 2014. In addition to the above, a Smart Net-zero Energy Buildings Research Network, consisting of 32 top Canadian researchers in solar energy and buildings from 14 Canadian universities, have joined forces to develop solar-optimized homes of the future. The budget of the Network is about $6 million, with $4.8 million from the National Sciences and Engineering Research Council's Strategic Research Networks. R&D funding is currently the most important support measure for solar thermal technologies and for low-energy and net-zero energy buildings in Canada. Training and education in these technologies through Universities and Colleges is also a very important support mechanism. Most solar thermal systems installed by business are also eligible for income tax reductions through accelerated depreciation. National standards set minimum quality levels for solar collectors and SDHW systems. Certification programs were established for solar collectors, SDHW systems and SDHW installers, however, they were not sustainable with the small market remaining after purchase incentives ended.